What You Do To Me is a sweet and funny book which leaves you feeling good and with a smile on your face. This was my first time reading a book by Barbara Longley and I really enjoyed her writing style and her ability to create relatable characters with realistic flaws. I particularly enjoyed the how the main characters Sam and Haley matured and developed throughout the book. I loved Sam's character, because really which girl would not love Sam the handiest handyman in Twin cities, he is gorgeous, caring and sweet. I liked Haley because of her independence and the way she faces situations strongly. The chemistry between Sam and Hale is combustible and I loved how they tried to fight their attraction in the beginning. 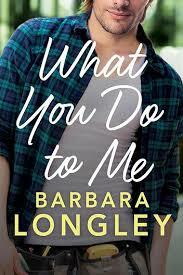 This was a great book with little drama and I look foward to reading more books by Barbara Longley. Sam Haley is known as the handiest handyman in Twin cities because he services both his clients jobs and his female clients. He is not into relationships or commitment as he has built walls around his heart after he lost both his parents at the age of fifteen. Haley Cooper, is a paralegal who recently had her heart broken by her high school sweetheart and fiance whom up and moved to Indonesia alone a few weeks before their wedding. She has been trying to renovate the house she and her fiance bought together and has been making a disaster of it. Her mother is worried for both her daughter and her house, so when she hears about Sam and his reputation, she decides to hire him in the hope to get her daughter to move on. After meeting sparks begin to fly between Haley and Sam, but Haley is worried about Sam's reputation and Sam doesn't want to get involved in a serious relationship. Will both Sam and Haley be able to get over their issues and accept what their hearts want?